Craggaunowen is doubtless one of the best tourist attractions in Ireland for anyone remotely interested in Irish heritage. 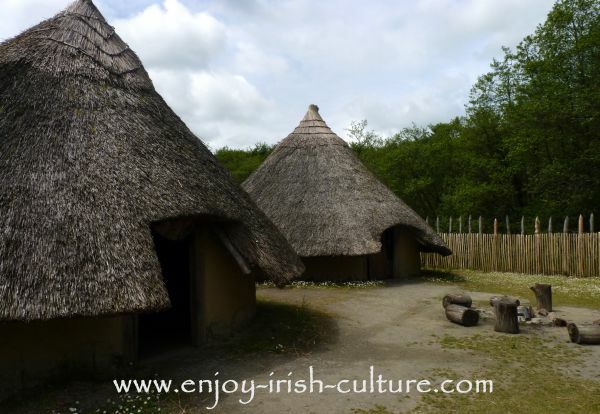 Have a look around the reconstructed ancient Celtic ringfort at Craggaunowen with us! Craggaunowen Castle, a 15th century tower house. Located near the small village of Quin in County Clare, Ireland, this outdoor museum gives you the opportunity to see how people on the island of Ireland lived throughout the millennia, starting from the bronze age. The museum is a labour of love that exists thanks to John Hunt who conceived the idea, bought the lands including the castle, started the works on the site on the reconstructed crannog and ring fort, built a hut for the famous ‘Saint Brendan’ boat, and donated his land, castle and collection to the Irish people. The different sites in this outdoor museum are spread over a large area, and there is a forest walk connecting them all. There is so much to discover here, a reconstructed crannog, a fulacht fia, a ring fort complete with a souterrain, a medieval castle even, and the boat that Tim Severin and crew undertook their Brendan Voyage in, an iron age road, canoe, Ogham stone, and a dolmen, just to name a few of the stops along the way. Read more about them here. 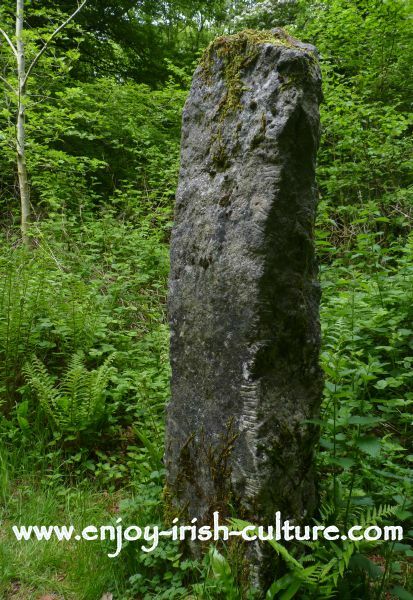 All of the displays aim to bring Ireland’s heritage and history to life, and they do that brilliantly, all in a beautiful and relaxing 50 acre woodland, lake side setting. There are animals to marvel at, too such as the wild bores in the woods which come quite close. But don’t worry, there is a fence. A real getaway for the day! We love it. One of the best tourist attractions in Ireland- the exciting reconstructed crannog at Craggaunowen. One of the best tourist attractions in Ireland has just become so much more accessible in the last couple of years since the opening of the new Galway to Limerick motorway. Coming from Galway, look out for the exit for Bunrratty Castle which is very well signposted, but for Craggaunowen keep going until the next exit which is number 12, then follow the R469 to Quin, and after that signs for Craggaunowen. The journey takes 1 hour 20 minutes from Galway, 50 minutes from Limerick, and 3 hours from Dublin. Craggaunowen is open between Easter Sunday and August 31st from 10 a.m. to 5 p.m. daily. Prices are very reasonable, adults pay 8 Euros, children over five pay 4.50 Euros and a family ticket which includes two adults and up to six kids comes in at 24.50 Euros. 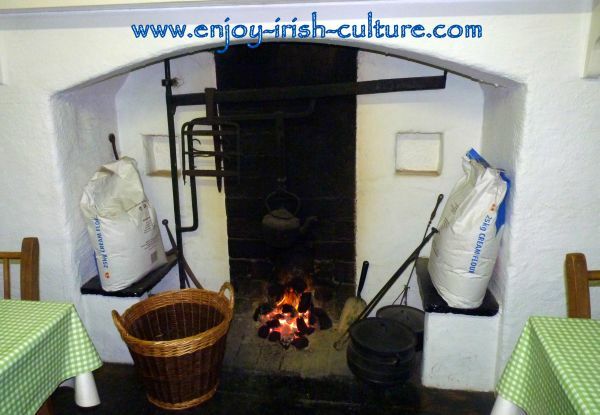 Tourist attractions in Ireland- Craggaunowen- the coffee shop itself is a cottage complete with old-style hearth. A visit to Craggaunowen is most enjoyable of course on a dry day when you can take your time and make it an all day visit that the whole family will enjoy. Bring a picnic and buy in tea and coffee from the coffee shop at the entrance. There are picnic tables right outside the cafe. At different times during the year, Craggaunowen hosts events such as re-enacted battle scenes, or showing Irish crafts in action. Look out for those for a really special day out. 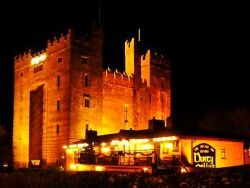 If you think you might be a regular to the area for the year ahead, consider getting the annual membership from Shannon Heritage which enables you to visit all of their venues all year around: Bunratty Castle and Folk Park, Dunguaire Castle, Knappogue Castle and Gardens, King John’s Castle in Limerick, and Craggaunowen. Thrown into the deal are some special events. Find out more directly from Shannon Heritage. 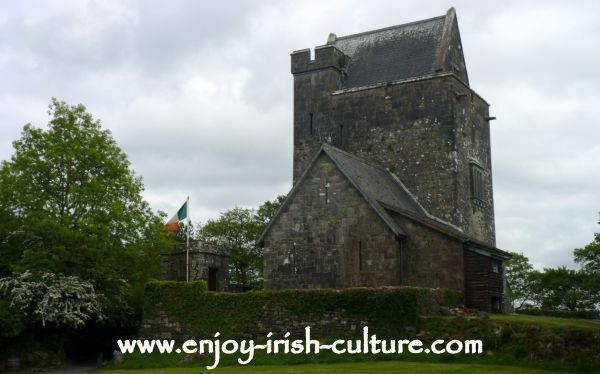 Connect the vist to Craggaunowen with a vist to Knappogue Castle which is located between here and Quin. You might also want to stop in Quin and take in the charming ruins of Quin Abbey which are worth the stroll. Hi there, like what you see on our website? If you do, why not tell the world about us? You cando this quickly and easily using the social functions we have provided at the top left and at the very bottom of all pages. Thank you so much. Your support will mean that others will be able to find and enjoy our content, too!